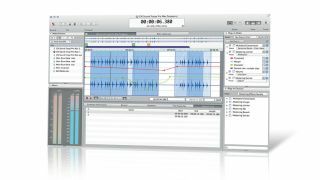 Sound Forge for Mac recently came out. What challenges were involved in bringing Sound Forge to the Mac? "We decided to build Sound Forge Pro Mac from the ground up in OS X, as opposed to simply porting it over. We fully understand that this means it'll take a little longer to get on par with the evolved Sound Forge Pro 10 feature set, comparatively speaking. But really, the moment you launch Sound Forge Pro Mac and experience the workflow, it's clear that this was the right thing to do. It feels right. It's slick. It looks and behaves like a Mac app should." Sound Forge for Mac currently lacks certain features that are standard in the PC version. Is this being rectified in updates? "Absolutely. We're paying close attention to customer feedback, and we're working on all the features they expect to see. We're competing with the legacy of Sound Forge Pro - a program that hundreds of thousands of people have been relying on for more than a decade. We'd like to thank the early adopters for getting on board now - these are the folks we're listening to." Your SpectraLayers software allows audio to be 'broken apart'. What are some of the most unusual uses you've heard of for it? "Ghost hunting and EVP analysis come to mind as a couple of outside uses I'm aware of. Forensics and CSI love it - the program was actually inspired by TV show fantasy crime-busting technology. Now it's made real! "SpectraLayers Pro 2.0 is under development and will include improvements in every area: processing speed, new tools, interface - across-the-board enhancements. Hats off to our early adopters here as well! "Everyone needs SpectraLayers - try it next time you have a problem that seems impossible to solve. Chances are it'll save your day." What's happening with ACID these days? Can you say anything about its future development? "ACID is still a heavy player in our product line for remix artists and loop-based music producers. Our Sound Series loop library titles working in ACID is still the fastest way to generate great-sounding, royalty-free music on a computer for any purpose. "After 15 years, we're still releasing Sound Series loop library titles, and we're still driven by the idea that everyone, regardless of their background in music, should be able to generate great tracks for any purpose with a simple EULA and a small budget." What's next from Sony Creative Software? Have you thought about branching out into, say, plugin instruments and effects? "We're not focused on making plugins and virtual instruments at the moment - our partners are totally dedicated in those areas. They're the experts and they're on top of their games. "With Sound Forge Pro Mac, for example, we're pleased to have iZotope doing the heavy lifting with a raft of killer signal and effects processing plugins and some great new repair tools too, right out of the box. In addition, Sony Creative Software has dedicated Partner pages where our users can go to find third-party audio and video plugins that will meet everyone's production needs."